On your five-day journey through the southern half of the Northern Territory, you will see the beautiful Glen Helen Gorge in Glen Helen, and then make your way to the highlights of the Red Centre: Kings Canyon in Watarrka National Park, and Ayers Rock (Uluru) and The Olgas (Kata Tjuta) in the Uluru-Kata Tjuta National Park. Your journey begins and ends in Alice Springs, a city rich in cultural experiences. 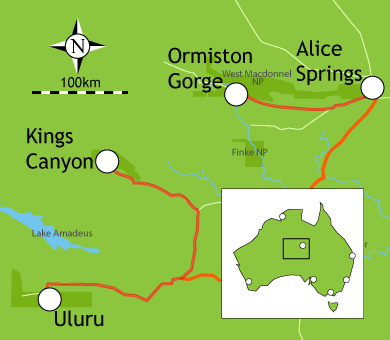 Your first day's drive is 133 km (about two hours) to Glen Helen via Namatjira Drive. One of only six permanent water holes along the historic Finke River, Glen Helen is situated at the far western end of the MacDonnell Ranges. Known for the nearby Glen Helen Gorge and the Glen Helen Nature Park, the area is rich in natural beauty and offers numerous opportunities for outdoor recreation. Whether viewed on foot as you walk the trails, or from above as you tour the area via helicopter, Glen Helen is a stop not to be missed. Here the West MacDonnell Ranges part, with steep pacoota sandstone cliffs towering over the Finke River and one of its six permanent waterholes. View the gorge from the Glen Helen Nature Park, or take the 20-minute walk down to the waterhole for some sightseeing and swimming. The Finke River is often referred to as the oldest river in the world. Located just north of Glen Helen, the Ochre Pits is the spectacular face of a multi-colored cliff. Here Aboriginal people mined the fine ochre for use in paintings, and also ground the pigment with Emu fat for use in ceremonial body decoration. Located in West MacDonnell National Park, the Ormiston Gorge and Pound is known for its breathtaking scenery and series of walking trails, including the full-circuit, 7km Ormiston Pound walk. Other popular walks include a 100-metre blindfold sensory walk, and the two-hour Ghost Gum Walk. Considered one of the most beautiful gorges in Central Australia, the Gorge impresses with sections that rise above 300 metres. Drive 260km south (about three hours) to the beginning of the Uluru-Kata Tjuta region. (The trip could be longer depending on which road you take.) Home to the Luritja people for more than 20,000 years, the area around Watarrka National Park was first explored by a European in 1872. With sandstone formations dating back 360 million years, more than 600 species of flora and fauna, and 100-metre red rock above palm forests dubbed 'The Garden of Eden,' this truly is one of the most spectacular environments on earth. If you are traveling with children or have limited mobility, take the moderate 2.6km walk at Kathleen Springs. Signs along the path give you insight into Aboriginal life and the recent cattle industry; take a break at the waterhole at the head of Kathleen Gorge, were you will also find BBQs. Today, drive 304 km south-west (about four hours) to Ayers Rock. Located in the Uluru ' Kata Tjuta National Park, Ayers Rock (Uluru) is one of the most iconic sites in Australia. Made of arkosic sandstone, Uluru is one of the largest monoliths in the world at 348 metres high and a circumference of over 9km. Extending 6km into the ground, the formation of Uluru began 500 million years ago. Protected and managed by the Anangu Aboriginal people, Uluru is believed to be the sacred ancestral site where the world was formed. Located in the Voyages Ayers Rock Resort complex at the gateway to the Uluru ' Kata Tjuta National Park, this resort campground features BBQ facilities, camper's kitchen, postal service, medical services, Internet access, laundry facilities, two full-sized tennis courts, swimming pool, jogging track, tour desk and information centre, shuttle service throughout the resort complex, live entertainment, self-guided walks to seven lookouts on the grounds, a shopping centre, and petrol station. A day trip from Voyages Ayers Rock Resort, The Olgas, or Kata Tjuta to the Aboriginal people is a group of 36 red domes about 50 km west of the resort. The massive monoliths are thought to have been one giant monolith larger than Ayers Rock, but separated and diminished due to erosion. Covering approximately 3500 hectares, the tallest dome at The Olgas reaches 546 metres high. A number of companies provide scenic flight tours over The Olgas, Ayers Rock, Lake Amadeus, and even Kings Canyon. Request tour-booking assistance from the tour desk at your accommodation, or book one in advance. Today, you will drive 305 km (about 3 ' hours) back to Alice Springs via the Lasseter and Stuart Highways. Once merely an outpost in the Outback, which is now the old Telegraph Station, Alice Springs is now a thriving city with a rich cultural life. The capital of the Outback, Alice Springs is home to the Arrente Aboriginal people. Start your tour at ANZAC Hill, and shop and dine your way down, and then visit the RSL and War Museum. A host of other museums, shops, and experiences await you in this oasis in the desert!